Sports Camps Canada is excited to introduce its first Nike Junior Golf Camps in Ontario. Nike Junior Golf Camps at Meadowbrook Golf Club in Gormley, ON are open to juniors ages 9-17 and is geared towards developing/intermediate experienced junior golfers looking to hone their skills in a fun and engaging environment. Throughout each week, campers receive professional instruction from Junior Development Coach, Bradley DeLuca (CPGA Class A Teaching Professional) of Peak Performance Golf and assistant who plays on University Golf Team. The camp will be coordinated by Director Erin Cochrane, who graduated with a degree in Kinesiology from York University and has been coordinating junior programs of all ages and skills since 2015. Coach Bradley DeLuca has had a passion for sports from a young age, competing as a junior athlete in a number of sports throughout his life. He has been involved with and dedicated to Youth Golf Development since 2010, and is actively involved in the planning and execution of junior golf programs at Bayview Golf & CC, The Country Club (formerly Board of Trade) and most recently The Granite Club. Meadowbrook Golf Club has been a community staple since its founding in 1960 and is operated by members for members. Spacious and beautiful, this facility is a friendly and gorgeous retreat just outside the bustling city of Gormley ON. Being the home of many distinguished large and small scale tournaments throughout the years and continuously revitalized, this Ontario gem is an ideal location to host the first of Ontario Nike Golf Camps. 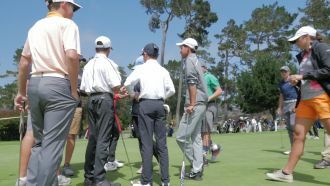 This Junior Golf Camp experience will be sure to not only result in great improvement in each young golfers game but will also leave a smile on their faces as they leave each day excited to come back.